Here’s our review of Marvel’s Avengers: Infinity War written and directed by Joss Whedon for Marvel Studios and Walt Disney Pictures. Avengers: Infinity War was the first superhero film to gross over $2 billion worldwide, topping The Avengers’ $1.5B and Avengers: Age of Ultron’s $1.4B. Being the sequel to ‘Age of Ultron’ and ‘Avengers,” the film certainly did get a push from those earlier films and makes a lot more sense after seeing the prequels. But, the film holds up as a standalone film on its own for even for non-Marvel fans. We’re not trying to give away any plot spoilers here but there are discussions of scenes and characters so if you don’t want to know anything about the film before seeing it don’t read any further! Avengers: Age of Ultron set the stage for ‘Infinity War’ and the battle with Thanos (played by Josh Brolin) in his quest for the six Infinity Stones. The film is the latest installment in the Marvel Cinematic Universe that started with Iron Man in ’08. The plot of ‘Infinity War’ is quite simple: stop Thanos from acquiring the six stones; but the journey and fragmentation of superhero teams and villains might be what makes this film so exciting, not to mention what may encapsulate the pinnacle of digital effects in filmmaking for our time. What would Star Wars had looked like if George Lucas had the technology the film industry now possesses? Would it still have been great storytelling? ‘Infinity War’ for the most part does not seem to go too far in terms of storytelling, but it does succeed in emulating traditional goals of a comic book series which is to provide great content from the first page to the last that teases the next book. And that is what the film does, because there can’t be one filmgoer who walked out of ‘Infinity War’ not wondering what will happen in the sequel. As always, we suggest you change your 4k TV picture mode to “movie mode” where the saturation and contrast are more natural to the original source — not hyper realistic like other modes created to enhance sports, soap operas, etc. If the picture isn’t bright enough for you, give it a couple days and may never go back to the other modes. The opening scene in outer space is truly spectacular, but doesn’t last long as it quickly jumps to the interior of a ship in which Thanos has ravaged the last survivors of Asgard is about to quash Thor and Loki on his quest for the Infinity Stones. This is a shadowy scene, the likes of which are more often found towards the middle or second-half climax-building parts of a film. More highlights can be found when the movie cuts to the Guardians of the Galaxy ship, where there’s so much detail in every frame you want to pause the image to take a look around before letting it go. On 4k Blu-ray you can almost count the hairs on Rocket’s furry head and get lost in those peering raccoon eyes. There’s another great space shot when the Guardians encounter what Thanos did to the last of Asgard and literally bump into Thor as he floats in space wreckage. The scene that tells the origin of how Gamora gets adopted by Thanos is also a highlight of the movie in terms of color depth and sharpness. It doesn’t last long but on 65” HDR TV it’s yet another scene that would be fun to watch in slow motion to examine every frame. Thor’s visit to Nidavellir to acquire a new hammer is another reason to buy the 4k Blu-ray. The external and internal shots of where Eitri (Peter Dinklage) has been left alone truly show the capabilities of HDR (if your TV supports it) in expanding color depth. The scene also looks great in 1080p and 2160p (without HDR), but comparing the two reveals so much more detail enabled by HDR10 (the HDR color specification used for ‘Infinity War’). This is pretty dark film overall, both in plot and cinematography. A TV with a wide range of contrast is certainly recommended for ‘Infinity War’ and it’s epic cinematography from Ben Davis who is also recognized for Guardians of the Galaxy (2014), Avengers: Age of Ultron (2015) and Doctor Strange (2016). There are plenty of layers of sound effects in ‘Infinity War’ to talk about. And, with immersive Dolby Atmos the audio is really impressive. In a nutshell, the more speakers you have the better this film will sound because of its multi-channel capabilities. What we usually look for is a soundtrack that allows dramatic scenes to explode with sound and image, but also retain a level of audibility for the dialogue throughout. ‘Infinity War’ is great example of how background music (composed by Alan Silvestri) and rich sound effects can be intertwined with vocals that never seem to get lost in the mix. While the Dolby Atmos track is preferable, not many consumers have upgraded to the advanced format yet so there’s a DTS-HD Master Audio 7.1 track that will play instead. There are also Dolby Digital 5.1 tracks in French, Portuguese and Spanish, as well as subtitles in all those languages and English for the Deaf and Hard of Hearing (SDH). Not crazy about the retro-looking graphics in the disc menu — it almost looks like late nineties website design or early Blu-rays with BD-Live features. But nevertheless this is the look Marvel was trying to achieve — they likely had many options to choose from that would have been more contemporary. On the 4k Blu-ray there isn’t much under the Settings tab, just Languages, Subtitles, and Disc Languages. I expected to see options for video and audio like turning on/off Dolby Atmos, but those options should be available through the disc Menu. For some reason the disc got stuck while trying to exit the subtitles menu, and I had to jump back to the main menu to get out of it. Then, realized it was better to access all the disc options through the Menu button the remote control. On the 4k Blu-ray there are no bonus features so we can’t review their 4k quality, only content. The Blu-ray contains quite a few bonus features including about 10 minutes of deleted and extended scenes, a gag reel, audio commentary, and four movie featurettes. The 4k Blu-ray and Blu-ray combos come with an extra disc and code to redeem a digital copy through Movies Anywhere. When redeeming, MA presents you with several options to redeem the best way is to choose Movies Anywhere which should get your copy across all platforms: Amazon, Apple, Google, Fandango and Vudu all in one shot. The experience of watching Avengers: Infinity War in theaters cannot be matched at home. It just can’t. There is just so much detail that the larger the screen you see it on the better. Even the green-screening, blue-screening or whatever they do for masking looks better in theaters, as some screening looked a bit fake on a TV. However, keeping the film dark throughout certainly helps with merging the multiple layers of imagery into a believable picture. The 4k Blu-ray clearly surpasses the Blu-ray version in both resolution and color range, especially if you have HDR. 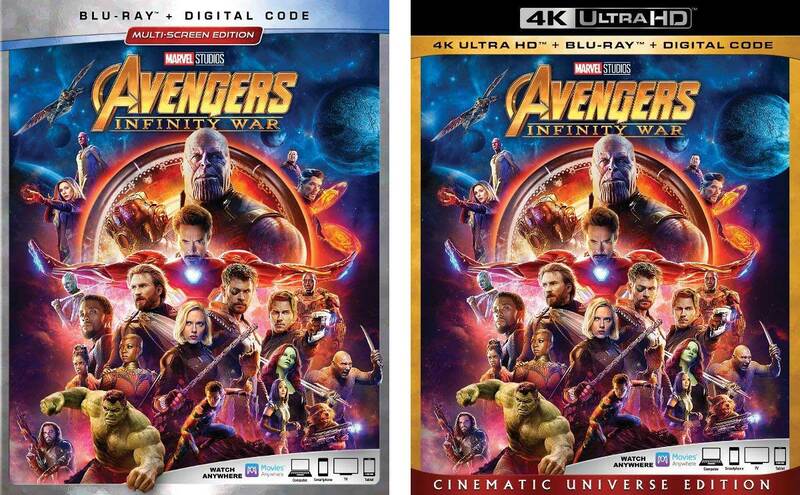 The Blu-ray looks great though on both 1080p and 2160p TVs, but can’t compare to the Ultra HD Blu-ray that essentially offers 4-times the amount of detail. If you haven’t seen ‘Infinity War’ in theaters, go see it. If you have, go for a second viewing. You’ll likely never have a chance again with the exception of the upcoming IMAX Marvel Cinematic Universe festival. Avengers: Infinity War definitely a contender for the best 4k Blu-ray Disc of 2018, but we’ve got several more months before deciding on that and there are plenty more UHD BDs on the way.